Harry Charles, son of Olympic rider Peter Charles, was the big star in the Flybusters Junior Grand Prix at 1.45m level. Calvin Böckmann, Thibault Philippaerts and Niels Kersten followed as 2nd, 3rd and 4th. They all have parents who have jumped at international level, just like the no. 6th, 7th and 8th!!! 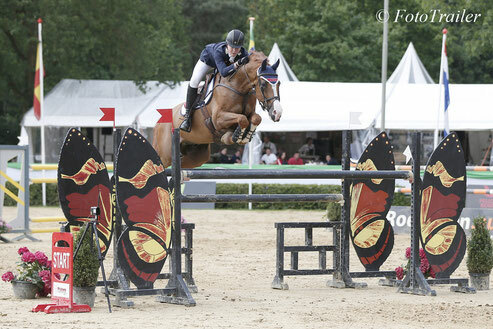 Calvin Böckmann (son of successful eventing riders Roger Böckmann and Simone Richter) won the 2nd prize with Carvella Z (Caretano Z). Number three,Thibault Philippaerts (son of Olympic rider Ludo Philippaerts) rode D Cancarra A.C. (Contefino). Best Dutch rider Niels Kersten (son of GP rider Pieter Kersten) became 4th with Can Win (Canabis Z). The only girl in the prize ceremony was Olivia Diaz Banon from Spain on the 5th place. Jack Whitaker (son of Olympic rider Michael Whitaker) finished 6th with Valentin R (Heartbreaker). Thibeau Spits (son of GP rider Patrik Spits) became 7th, followed by Max Hainhorst (son of GP rider Martin Haunhorst).